The Zend Framework has become one of the most popular frameworks recently. This article will discuss this framework and its implementation. The Zend Framework has become one of the most popular frameworks recently. You know that the PHP is an object oriented language and it has become very popular. The PHP stands at the top of the dominant languages. It was installed on most UNIX and Linux based web servers. And if you were a programmer, it was easy to get a hosting account that would let you use it. You can easily communicate it Java, J2EE, Perl languages. Zend is a PHP based framework. Recently, web development has become a very bloodthirsty arena for programming languages and by using the framework, user can do various kinds of activities. As a result, there has been an excess of options for programmers to choose from. Most of the time, a significant amount of time can be spent on searching for tools to speed up development instead of recreating from scratch. This writing is aimed at PHP developers who are looking to learn more about how to acquire knowledge of Zend based framework. This is not a comparative list of all PHP frameworks, as there are many new options like CakePHP and Symphony to name two. Zend framework seems to fit nicely with my requirements and it may not too long time to become familiar with this. A web based server supporting mod_rewrite or similar functionality. I have assumed that you are running the PHP 5.2.3 or higher with the Apache web server then your Apache installation must have the mod_rewrite extension installed and configured. This time, you must also ensure that Apache is configured to support .Htaccess files. If you want, you can download the zip Zend framework from any website. The Zend Framework is supplied with a new command line tool. Folder window to the C:\Program Files\ZendFrameworkCli folder. You will get two sub folders: bin and library within it. Within the Control Panel find out the System section. Choose Advanced and then press the Environment Variables button within it. This time adds; C:\Program Files\ZendFrameworkCli\bin to the end of the input box and press okay. By this way you will able to configure the Zend framework on your system and able to enjoy the great feature of it. The ZF apparatus will create a directory called zf-tutorial and populate it with the recommended directory Structure. The presented application/ directory is where the source code for this website stands. We have separate directories for the replica, view and controller records of our application. Here, the public/ directory is the public-facing root of the website and that means that the URL to get to the application will be http://localhost/zf-tutorial/public/. This is so that most of the application files are not accessible directly by the server and so on. Copy the library/Zend/ directory from downloaded archive file (ZendFramework-1. 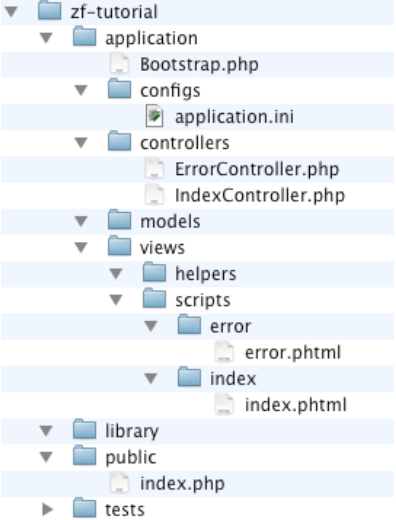 9.0. zip) into your self-tutoring and library/, so that your zf-tutorial/library/ contains a sub-directory called Zend/. The Zend Framework controller uses the Front Controller design model and routes all requests through a single index.php file. This formant able to ensure that the environment is set up correctly for running the application (identified as bootstrapping). We reach this using an .Htaccess file in the zf-tutorial/public address list that is generated for us by Zend_Tool which redirect all requests to public/index.php which is also created by Zend_Tool. This is a quite easy job to change the formation of it. The index.php file is the entry point of our application and is used to create an instance of Zend_Application to initialise our application and then run it. This file also defines two constants: APPLICATION_PATH and request_ENV which define the path to the application/ directory and the environment or mode of the request. The generated .hatches file sets it to develop. The Zend_Application starts at the beginning of the server. It starts up when the component is used to start up the application and is configured to use directives in the configuration file: application/configs/application.ini. This file is also auto-generated for us .The Bootstrap class that extends Zend_Application_Bootstrap_Bootstrap is provided in function/Boostrap.php which can be used to execute any specific startup code required. By using this way we will able to run and configure the Zend framework. This framework helps us start any PHP project. Recently PHP offers object oriented facilities. That helps a lot to the programmer with vast development of the project. You know that Zend is a lightweight framework that helps a lot to integrate PHP language quite easily within it.